When I posted pictures of my Napoleonic Black Watch last week, the mention of my modern version created some requests on various boards. So I think I shall deliver. 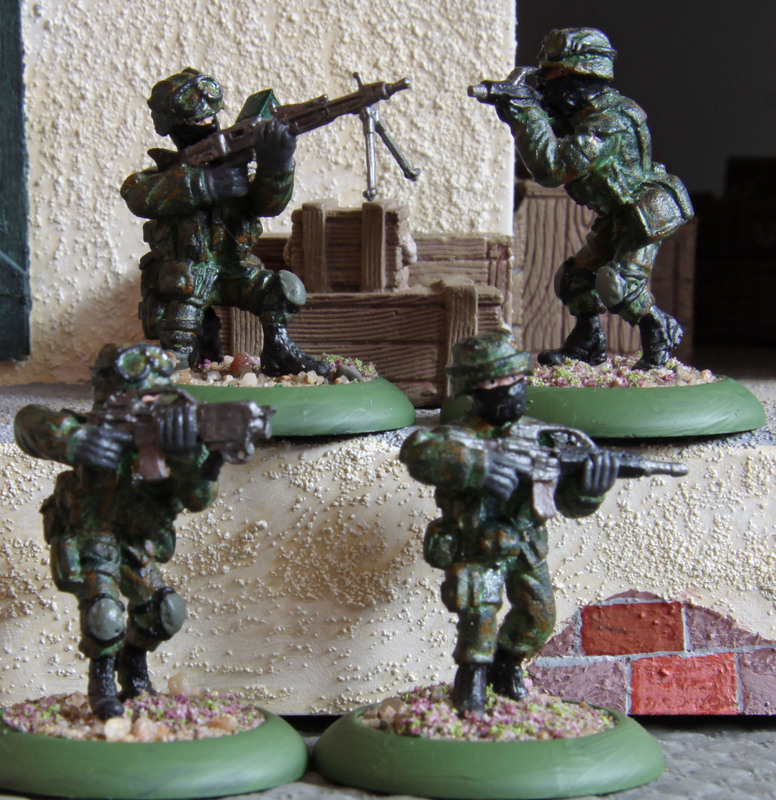 The troops painted are meant to depict A Company, 3rd Platoon, “The Black Watch” around 2003. By that time the Regiment was still an independent entity. On the 28th of March 2006 they became the 3rd Btln. of the Royal Regiment of Scotland. IMHO this was a very sad amalgamation, even though necessary from a financial point of view. The Black Watch was founded in 1725, but it´s historical roots date back well before that, to the Clans of the Campbells, Grants, Frasers, Munros. It fought at Fontenoy, Ticonderoga, the American War of Independence, Alexandria, The Peninsular, Quatre Bras, Waterloo, the Crimean War, the Indian Mutiny, the Frontier and Boer Wars, both World Wars, Korea and the Invasion of Iraq. Over this period 14 Victoria Crosses were awarded to members of the Regiment. The amalgamation at the very least saw this heritage damaged. The component units were no longer to wear their old badges, tartan patterns, distinctive headgear or hackles. In the end they were at least allowed to keep their headgear and hackles. Since all the Regiments will wear Government pattern Tartans, this will mean no change for the Black Watch. But all in all, this still does not feel right to me. Anyway… back to the minis in question. The unit depicted by me consists of a whole armoured platoon. This means 4 Warrior IFV´s, a command section consisting of a LTD, the platoon SGT, a radioman and a sniper, as well two 8 men sections. Now each section is subdivided in two. One half being led by a CPL, the other by a L-CPL. 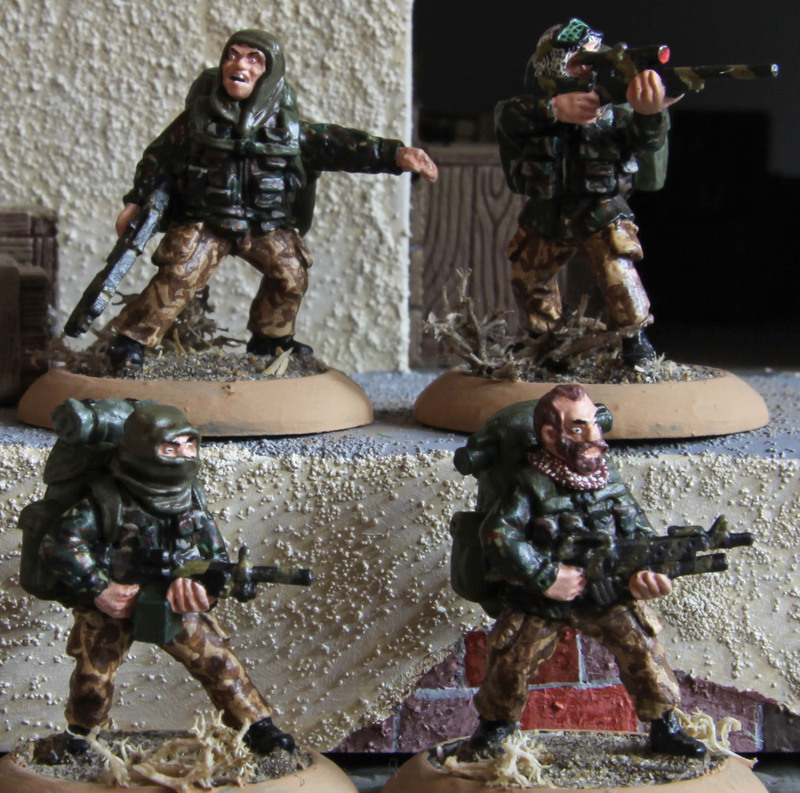 Each section has two Grenadiers (already armed with an SA-80 with GL-36 grenade launcher), two riflemen (one with a LAW 80 rocket launcher) and two LMG´s as well. Since this was meant to be an interim TO&E I decided to leave one of the old SA-80 LSW´s per section and only grant them one Minimi LMG. 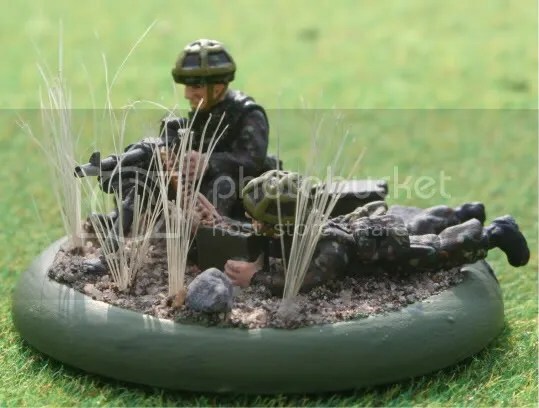 As additional assets there is a medic and a bagpiper, that can be attached to the command section, as well as a support section, mortar section and a HMG team. Most of the minis shown above, are converted to a certain degree. 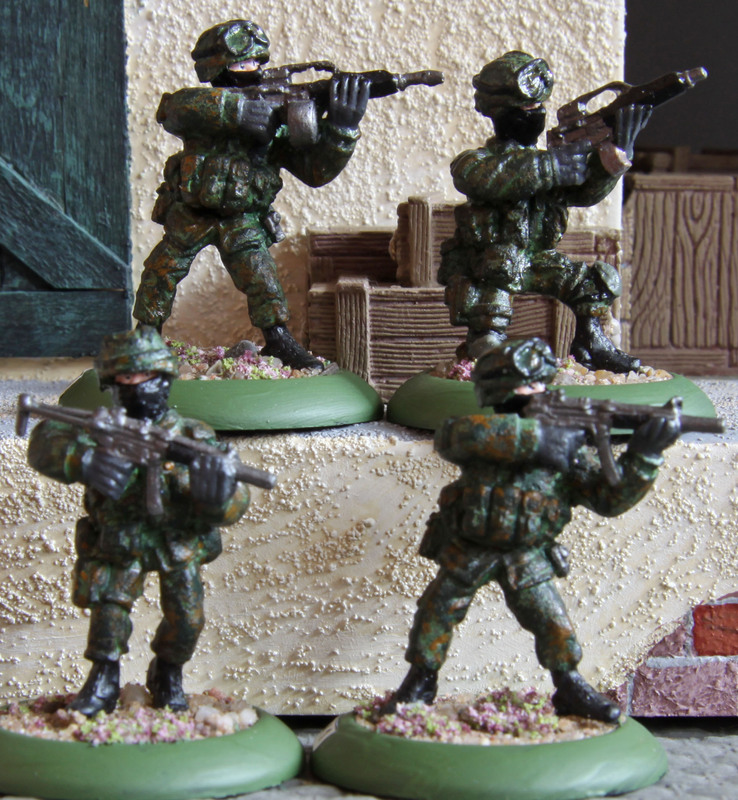 With the exception of the sniper they are all Devil Dogs Design, from both their first and second releases. 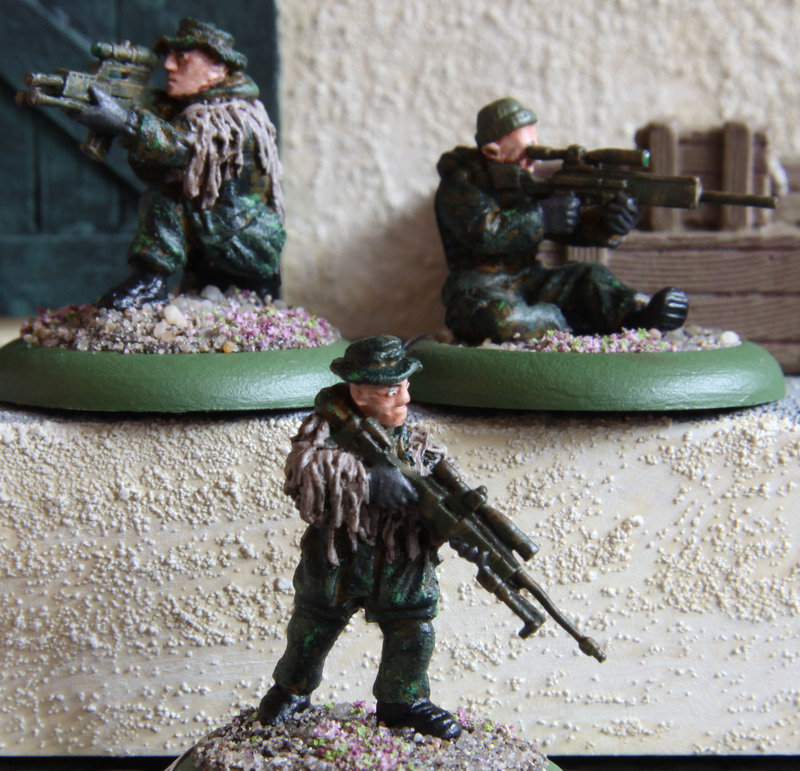 The first release was wearing parkas, while the second was not, so all minis from the later had to be converted. Same goes for the SA-80´s with underslung grenadelauncher and the LAW 80´s. Since no minis with either were available, these had to be scratch build. The first section got burlap straps sculpted onto their helmets, the second got Tam´s, while the 3rd were allowed to retain their helmets.The medic was sculpted from scratch with the exception of the head / helmet. The additional assets below are TAG minis. What really surprised me, when I took these out of the box this week to take some photos, is their looks. I painted these eight or nine years ago and could have bet, that my painting had not changed too much, but it really has. Is this it? No! Obviously a mechanized unit requires some rides and these come in the form of 4 Imprint models Warrior IFV´s. 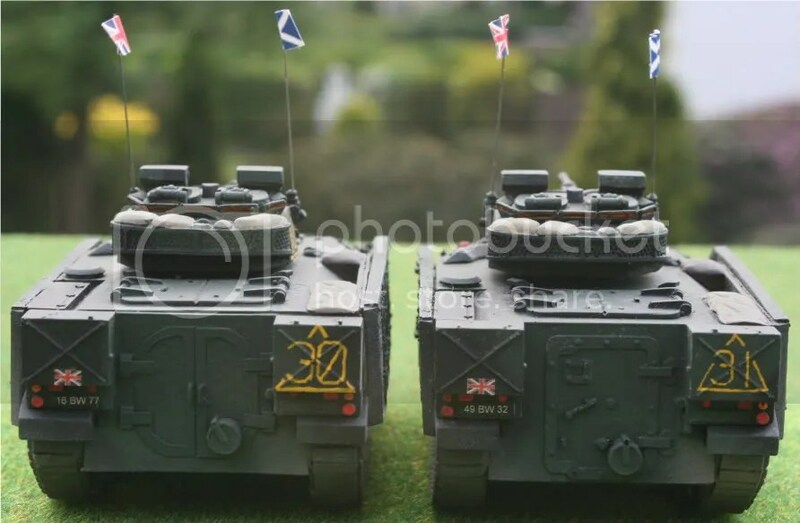 Now, unfortunately the British Army decided to fit the command Warriors with different doors, so I had to convert one of them (# 30). Now the British Army has one problem, when it comes to its mechanized infantry, when compared to other NATO nations. The IFV´s feature only autocannons and lack ATGM´s. On the tabletop (as well as in real life) this makes combined arms operations absolutely necessary. So I could not leave it at this. When the Black Watch was stationed in Germany it was meant to form a battlegroup (which would be called the Black Watch Battlegroup) with the Scots Dragoon Guards and the 9th/12th Lancers. It actually did so, when when it supported the USMC near Bagdad, although the 9/12 L were left in Germany and Royal Marines took their part. So my battlegroup also got two Challenger IIs from the HQ section of the Scots DG´s as well as a Striker and a Scimitar from the 9/12L. the former two are Imprint models, the later are from HLBS.